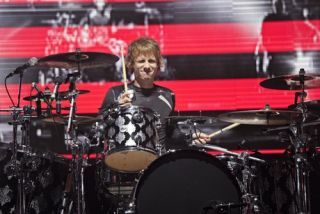 Dom Howard has brushed criticism for the band's Olympics song, saying it's not just something for the Games, it's a full-blown Muse track. Discussing the song, 'Survival', drummer told NME: "It's a proper Muse song. It's not something we just did for the Olympics. They sowed a seed by asking us to do some music, but then five months went by. We showed them a few songs when they asked us about the closing ceremony, and they loved it. "It represents the enormous competition of what the Olympics is." What do you make of the track? You can hear it below.